As small, open economies the Nordic states have always been more dependent on foreign trade than larger powers, and have thus had a historic preference for free trade. But during the inter-war period the Nordic countries were squeezed between powerful and aggressive trading partners: above all Great Britain and Germany. Although the period between the end of the First World War and 1929 was marked by a return to a liberal world economy, the Great Depression ushered in a decade of protectionism. The bilateralisation of international trade was especially evident after Britain’s Ottawa treaties in 1932 and the Nazi seizure of power in 1933. Their dependence on trade with Britain and Germany meant that the Nordic countries were exposed to the full force of British and German bilateralism. The paradox is that in spite of international trade wars and regulated exchange the Nordic countries managed better than other European states during the interwar period, and that the Great Depression was not as deep or long lasting as in other countries. The chapters in this book discuss why and how this rather successful Nordic experience was achieved. The topics covered include commercial and monetary policies but also important industries such as forestry, agriculture and fishing. 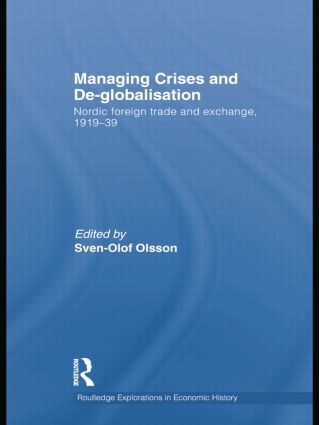 Many of the chapters are comparative and discuss economic developments in two or more Nordic countries. Sven-Olof Olsson is Assistant Professor at the Department of Economic History in the Faculty of Social Sciences at Gothenburg University, Sweden.